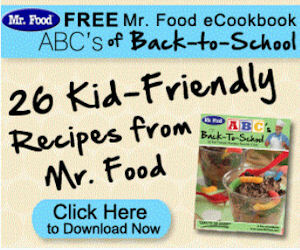 Free eCookbook: The ABC's of Back-to-School: 26 Kid-Friendly Recipes from Mr. Food Free eCookbook, features 31 pages of our very best kid-approved recipes sure to make the grade this school year + Mr. Food Recipe eNewsletter for FREE! Get this brand new FREE eCookbook collection full of triple-tested kid-friendly recipes, including grab ‘n' go breakfast recipes, simple snack solutions, time-saving dinner ideas and extra-fun treats. Our free eCookbook is here to make the back-to-school season easier with fast, easy and kid-approved meal ideas. In true A-B-C fashion, we've got one recipe for every letter of the alphabet! The eCookbook has stunning colorful pictures and step-by-step instructions for easy recipes like Dirt Cups (page 7), Popcorn Lollipops (page 12), Mac and Cheese Cups (page 13), Itsy Bitsy Pizza Bagels(page 16), Buffalo Chicken Wraps (page 23), and lots more.